You are currently browsing the The Pet Product Guru blog archives for the day Tuesday, August 13th, 2013. Are you thinking about adopting an adorable Cocker Spaniel? here are some things that you should know about this breed. 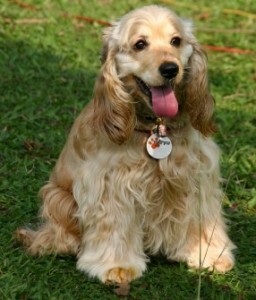 The american Cocker Spaniel has a rounded head, very long ears and a feathered medium length coat. They are cheerful and sensitive pets. They are also usually gentle and trusting pets and are very playful. Cocker Spaniels should be socialized at a very early age or they have a tendency to become shy and uncomfortable around people they don’t know. I had a friend who owned a Cocker Spaniel and every time someone strange would come to the door, she would bark and then run into the bedroom and not come out until the person was gone! They are usually good with children but must understand their place under humans. They need a firm loving owner and daily exercise. If you are not available all the time, it might be a good idea to get a dog exercise pen for him to play around in. The Cocker Spaniel is easy to train and for the most part, they get along well with other animals. They can be difficult to housebreak so be patient. Don’t let your new family member develop “small dog syndrome.” This is where lots of dog owners go wrong. The dog believes that he is the pack leader to all humans. You must start early. Train him to know that you are the leader. If you don’t, behavior issues may develop. The Cocker Spaniel usually does well in apartments but make sure to take him on daily long walks so that he gets plenty of exercise. Enjoy your new family member!! Six great radio stations ranging from popular standards like Sinatra and Ella to The cure and Madonna, check out THE EDGEWATER INTERNET RADIO NETWORK!